12 1/2 x 7 1/2 x 3 3/4 in. Purchase, with funds from Donald and Donna Baumgartner, M2002.170. At first glance, the Museum’s stunning Nautilus Cup looks like an impractical way to drink. Tankards and beakers, which are also on display in the Museum’s Gallery #2, make sensible drinking vessels. In comparison the nautilus cup, a chambered nautilus shell mounted with elaborate metal work, perhaps could function as a drinking vessel, but seems more convincing as an aesthetic object. Would anyone use this stunning object to serve beverages? If not, why would anyone have this kind of odd-shaped cup? What did it mean? 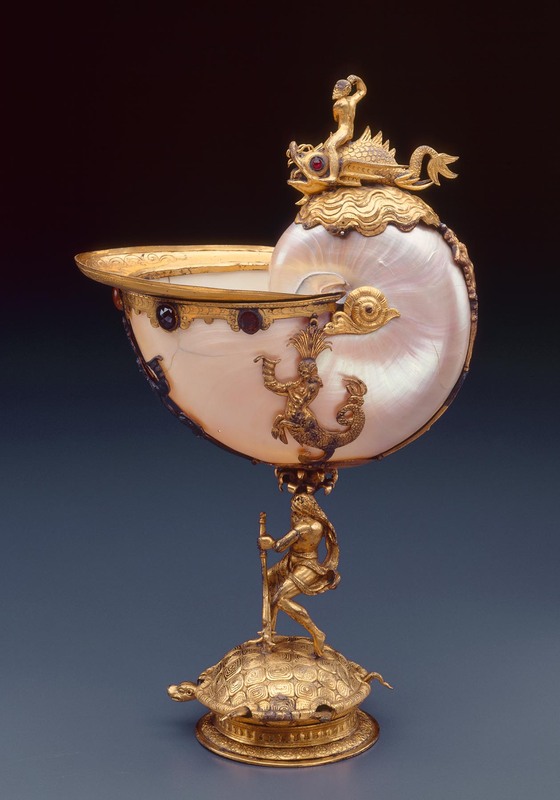 In directly combing man’s art with God’s nature, a nautilus cup was the type of treasure that would have been housed in a Renaissance Wunderkammer. Wunderkammer were privately-owned collections that are considered the predecessor of the modern museum. 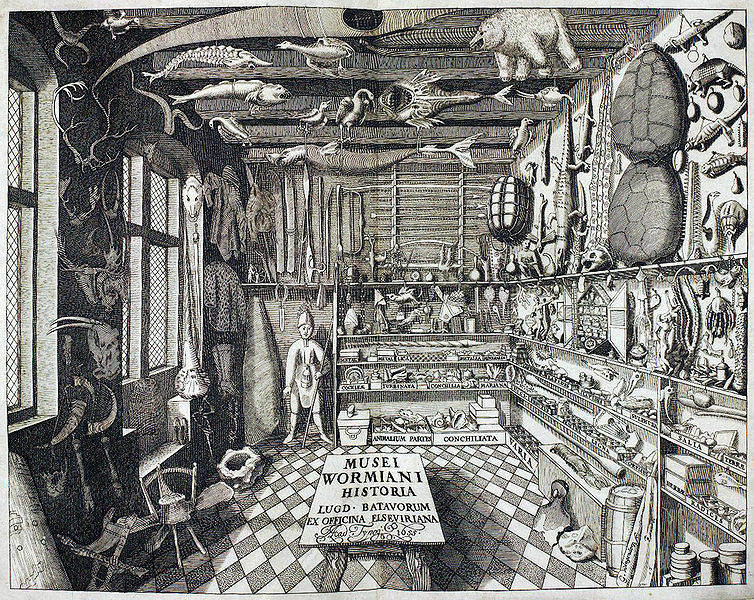 German for “room of wonder” or “cabinet of curiosities,” Wunderkammer developed in mid-16th-century Europe and celebrated man-made arts and also natural arts, with minerals, ivory, ostrich eggs, coconut shells, nautilus shells, and other exotic objects. The Museum’s own American Galleries on the Lower Level are installed as a type of Wunderkammer. Some noblemen commissioned pieces of furniture that displayed smaller collections of specimens. One example is the Augsburg Cabinet, which you can explore in this interactive site by the J. Paul Getty Museum. Ole Worm (1588-1654), Museum Wormianum; seu, Historia rerum rariorum… Leiden: ex officina. Elseviriorum, 1655. 6 p. l., 389,  p. illus. Smithsonian Institution Libraries. The Renaissance and Baroque period was the Age of Exploration in Western Europe, when things from foreign lands held great fascination and spurned the imagination. Shells from the chambered nautilus are a perfect example, since they come from a sea creature that lives in the Pacific and Indian oceans. (The people of the Andaman Islands in the Indian Ocean use nautilus shells as every day drinking cups.) When the outer skin is removed, the shell shines magically, and when cut in half, the construction is mysteriously mathematical. The shells, in fact, were believed to have special powers and reflect the order of the universe. To enhance a prized shell, a goldsmith would add stunning and protective mounts of gilt bronze, copper, silver, and precious and semiprecious gems. Other examples of Nautilus Cups are in the British Museum (which has a turtle base just like Milwaukee’s); The Royal Collection; the Los Angeles County of Museum of Art; the Hermitage; the Victoria and Albert Museum; the Art Institute of Chicago; and the Baltimore Museum of Art. As the shells come from the sea (the word nautilus itself comes from the word for “boat” or “sailor” in Greek), it is appropriate that the figures on the Milwaukee Art Museum’s mount relate to water, including gods from the Classical past so important during the Renaissance. Flemish or South German, Nautilus Cup, 1575/1625. Shell, gilt bronze, copper, silver, and semiprecious gems; 12 1/2 x 7 1/2 x 3 3/4 in. Purchase, with funds from Donald and Donna Baumgartner, M2002.170. From the top we have Poseidon, god of water (missing his trident) astride a sea-monster with glowing red jeweled eyes. Together they ride a wave up over the curve of the pink shell, a great aesthetic combination of form and subject matter. Below, a charming snail sits at the center of the shell. In the lower part of the shell a tritoness (a sea goddess very much like a mermaid) blows her conch shell. The stem of the cup is a figure of Hercules, leaning on his club and wearing his lion skin cloak, who struggles to hold up the cup while balancing on another marine creature, the turtle. The turtle’s head, legs, and tail even move! Nautilus cups were often used in still life paintings because they were exotic and beautiful. The 17th-century Dutch artist Willem Kalf (1622-193) used a nautilus cup in a number of his still life paintings. In his 1662 Still-Life with a Nautilus Cup in the Thyssen-Bornemisza Museum of Art, Kalf depicted a nautilus cup with other highly esteemed objects such as a Chinese Ming bowl, a wine glass, and a Persian carpet. The combination of metal and shell allowed the artist to experiment with light and shadow, challenging him with metallic reflections and translucent materials. The shell itself appears to be the body of the fantastic sea monster—which, in fact, is the Biblical whale that swallowed Jonah. You can just make out the figure of Jonah trying to avoid the teeth, almost as if he is going to dive into the nautilus for safety. Today, there is the environmental concern that the chambered nautilus is disappearing due to over-harvesting. Because of its shiny surface, the shell is used in jewelry and other ornamentation, and fisherman are killing them at great rates to fill the demand. The fascination with the nautilus has not waned in the past 500 years! The next time you are in the Milwaukee Art Museum galleries, take a moment to look at the Nautilus Cup in person. The lighting makes the shell glow from the inside—and it is easy to think that it really is magical! This entry was posted in Art, Curatorial and tagged 16th Century Art, 17th Century Art, European art, From the Collection, nautilus cup, Renaissance, Willem Kalf, Wunderkammer. Bookmark the permalink. This is one of my favorites. I am so glad it is on the way into the rest of the museum, so that I can take a second to marvel at it every time I enter. I am a amiture artist ( who just by happenstance ) aquired a nautilus shell and am collecting ideas to make something with the shell. I have already been carving in bone and ( hopefully ) find someone who has skills in fine metal work to combine all three. Your shell is just what I needed to get me going. I live in the Detroit metroplex area and there is a lot of artists coming here because of the cheap rents and I hope to connect with some of them for this type of work. Good luck to you, Leslie. I hope art flourishes in Detroit. A nef is a vessel shaped like a ship, so that doesn’t apply to nautilus cups. We do, however, have a nef ewer in the collection! It’s made of glass, and you can see it on our collections website here: http://collection.mam.org/details.php?id=6975. Sorry, perhaps I was too brief. Ornate nautilus shell vessels like this were often salt cellars, not for drinking. Not all nautilus salt cellars were shaped like ships, although ship-shaped ones were common and modern collectors call them all nefs—a word that is etymologically related to ships. So, rewording my original question, is this particular vessel really for drink? Or is it for ceremoniously presenting the salt to the high table? And how could one tell the difference? Thank you for the further explanation. As you say, cups like this were not really used for drinking. I referred to drinking from it at the beginning of the post more to point out the fact that thought we call is a “cup”, it is not a functional object but is instead a decorative showpiece. We can’t really tell if our nautilus cup was used as a salt cellar, but that’s a very interesting point!